Seas; swells; wind waves; Arabian Sea; mixed sea state; wave spectrum. 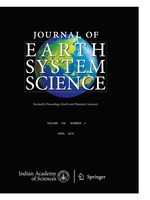 Wind wave spectra were recorded simultaneously at three shallow (water depth 7–9 m) locations (Malpe, Honnavar and Karwar) along the 200 km stretch of the state of Karnataka in 2009 during 27 April–24 May (representing conditions prior to onset of the Indian summer monsoon), 12 June–8 July (monsoon), and 1–31 October (post-monsoon). Each spectrum was based on data recorded for half an hour using a waverider buoy. The paper describes characteristics of the spectra and the wave parameters derived from the spectra. Both reveal the dramatic changes that occur in the wave field due to the summer monsoon. The changes were virtually identical at all the three locations suggesting that the wave characteristics described here are representative of the conditions that exist along the coast of Karnataka State, west coast of India. Ocean Engineering, National Institute of Oceanography (Council of Scientific & Industrial Research), Dona Paula, Goa 403 004, India.